Win a Seagate 1TB 7200RPM HardDisk, Kingston 64GB Class 10 MicroSD and Php500 Sodexo GC – Qlick Christmas Promo! Share this Promo to your Facebook Timeline. 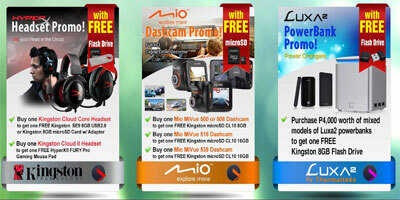 Purchase any of Qlick Cafe Products: Seagate, Kingston, Thermaltake, Luxa2, Mio (Dashcam). Share your selfie photo holding the purchased product and tag qlickcafe.